Everyone goes through it at some point. 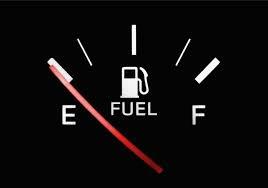 The gas gauge needle is pointing towards the “E” and in some cars the light starts to flash or there’s a little beep that is supposed to remind you that your car is close to being empty of gas and if you don’t pull into a gas station soon the car will sputter and die from lack of gas. It’s a great analogy about our spiritual lives, except we don’t have little warning lights or “beeps” that go on to remind ourselves that we’re running on empty. Instead, we start to sputter and cough and before we realize what’s happening, we’re stopped. Stopped dead in our tracks. It may require a boost to get us going again. A boost like a crisis that requires us to refocus and redirect our lives back to God. It may be an actual death in the family, where we are reminded of the frailty of life and we need to re-evaluate our own lives. It may be a mountain-top experience like a retreat or a conference that re-charges our batteries and keeps us going, for a little while at least. I’ve noticed that when I stall out spiritually a good boost does help for awhile but it’s a short-term solution to the real problem. Just like a car that needs daily upkeep to keep its engine running smoothly to avoid breaking down, I need to spend time daily recharging MY spiritual batteries by spending time talking to God and spending time in His Word. If I don’t, it won’t be long before I will be running on empty and worse, completely stalled out and in need of a boost or a good push to get me going again. A good push? Just like a car dead in the middle of the road, a couple of well-meaning good Samaritans may come along to help push that vehicle off to the side of the road and may even stay with you while you wait for a tow truck. Without their help, you’d be stuck there. It’s amazing how that analogy works with spiritual stalling out too. I don’t always have the will power myself to get out of the slump on my own. That’s when I need a good “push” to get rolling again. I have several friends who always seem to be available with a smile and a hug. They check up to see if my spiritual gauge is starting to point down. When I need a boost they get me back on track. They always know what to say and pray to get me recharged! Are you running on empty? Maybe you need a boost or maybe a good push so you don’t stall out. Look for ways to recharge those spiritual batteries but don’t forget that daily maintenance is necessary for optimal performance. This entry was posted in Inspiration & Devotion, Proverbs 16:9 - Journey Thoughts and tagged car, car repair, gas gauge, running on empty, spiritual batteries, spiritual stalling. Bookmark the permalink. Thank you Lynn — and sometimes the Lord uses a writer to give someone that needed boost! “Look for ways to recharge those spiritual batteries but don’t forget that daily maintenance is necessary for optimal performance.” I love this. Sometimes I get so tired from running around from work, to ministry, to my social life that I find myself on “empty” and the last thing I want to do is attend another Bible study or prayer meeting… and usually that’s the very thing I need to do to get recharged again. So many times I forced myself to go places that I knew would be good for me but I didn’t want to because of stress (or lack of desire) but I ended up being so blessed at the end because of the encouragement I received from my brothers and sisters in Christ. Of course, it’s best that we always maintain our relationship with God daily so that we never reach empty but if we do… we always know where to go and who to turn to in order to get refueled once again. Thanks for sharing this. Be blessed!